As you can tell from the title, I am taking charge! And nope, I am not a big boss lady. I am taking charge of a DIY project. A "charging station" project. I am writing this late at night, please forgive the lameness that is ensuing! It's actually a tray, that I found in the bathroom section, meant to be used as a drawer divider to hold things such as toiletries and cotton balls. But I don't have any drawers in my bathroom. Ok, that sounded weird. 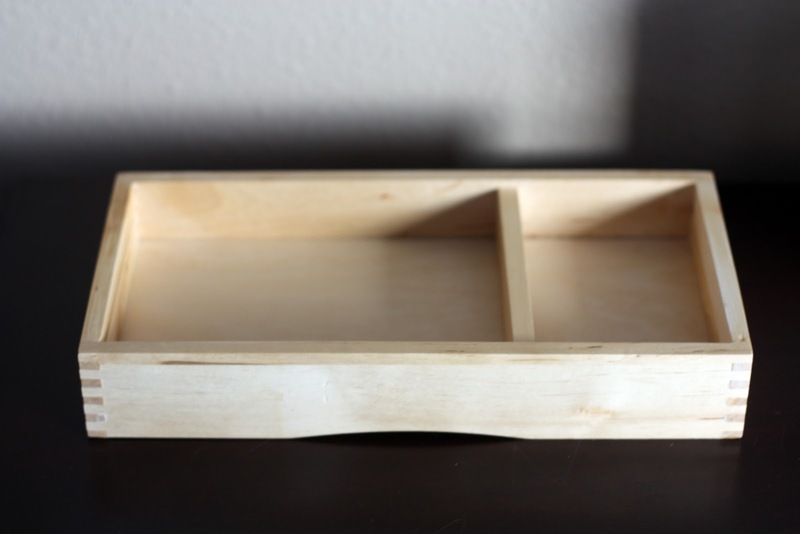 For us, the point of this little tray wasn't to be used as it's intended drawer dividing purpose. Nope, it was to be used as a place for my man to toss the contents of his pockets. 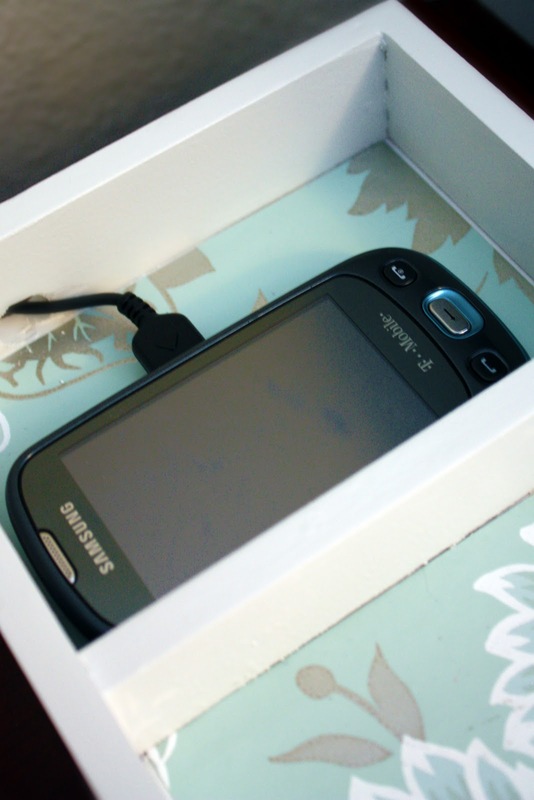 You know, for those things that end up either on the console table, or the kitchen counter, or under a stack of papers, or in the washing machine... the phone, keys and wallet. Notice, most things have a place, I have my handy little phone charger. Life is good. But the hubs, his side was filled with some flowers, our water carafe, a random pile of loose articles and a charger cord for his cell phone which is typically wrapped around something so it won't fall to the floor each morning when he unplugs his phone. Oh how I wish I would have taken a good "before shot". I must get better at that. But I wasn't done yet. Using some leftover wallpaper from our closet project, I measured the openings to the box, and cut the paper down to size. To secure the paper to the bottom of the tray, I snagged my handy bottle of Mod Podge! So how do I feel about my recently completed tray converting project? 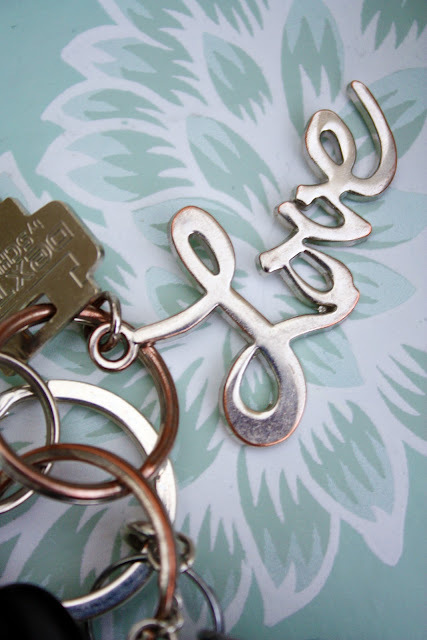 Well, the word on my keychain sums it up quite nicely! 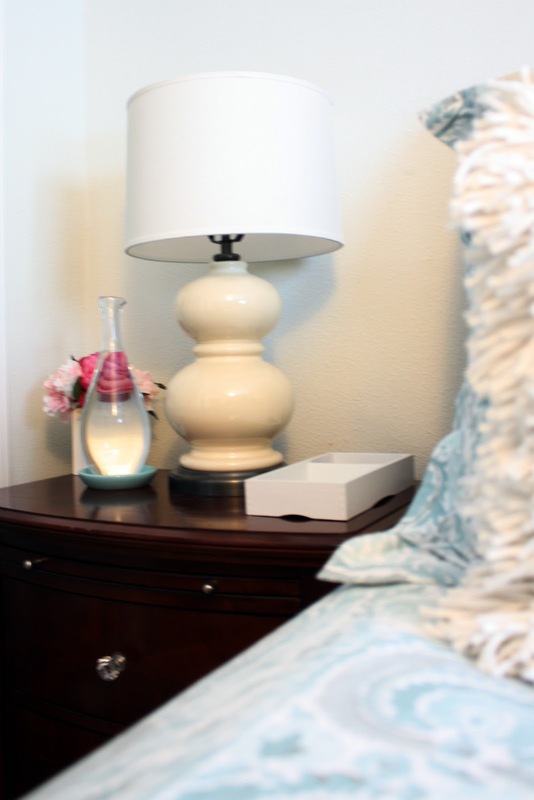 Now giving everything on his nightstand a place to call home also. Gotta love a happy ending like that! Who else is ready to take charge? 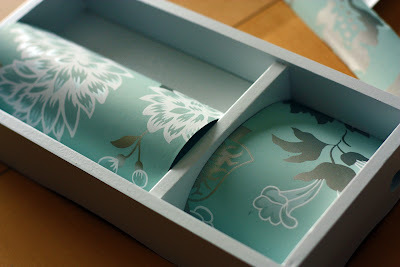 Anyone inspired to find some random empty container in their home to turn into something functional? Any other home made charging station experiences? we've got a great melissa and doug spelling set tray just waiting to be transformed into a remote holder for our coffee table. Another insanely adorable project that I would never have thought of on my own! Love it! Love love love! I've been looking for a charging station for all our phones & ipods. And the ones I've found are either extremely pricy, or ugly. What a genius idea, and it's super cute too! Love it! So cute! And I love you bed comforter too! Where did you get it? I need to redecorate! And I'm definitely going to Ikea for that little tray! this is so cute! i think my boy would need a jumbo size, ha! Fabulous! Your projects are such an inspiration--thanks so much for sharing. 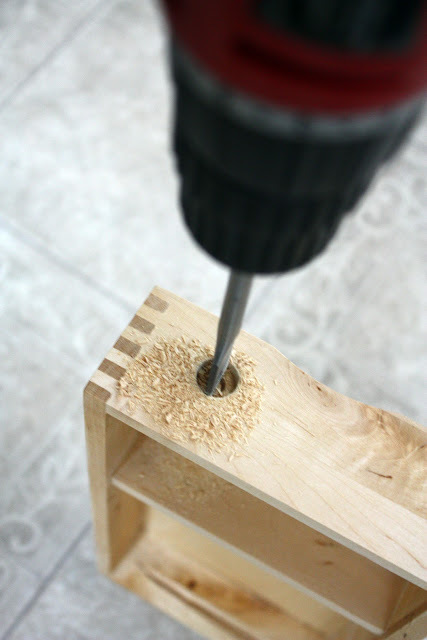 If you clamped a scrap piece of wood to the inside of the box before you drill, you would greatly reduce the 'tear-out' on the edge of the hole. very cute and clever solution! i've also never met a container i didn't like! lately i've been finding uses for those little plasic containers that lunch meats come in as drawer dividers for drawers that seem to be the 'catch all' or *junk* collecting spaces. with everything in it's own container there's no jumbled up mess and everything has it's own little place inside! I've been waiting to hear what you were going to do with that tray! This is fabulous! 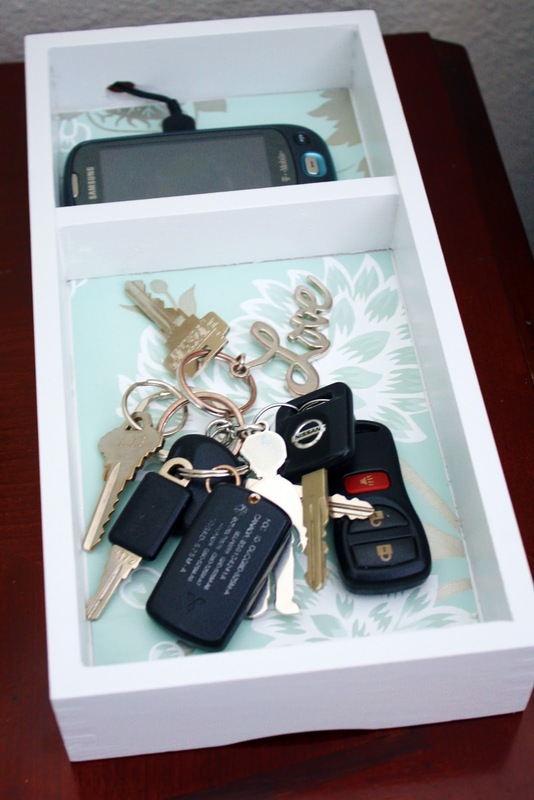 My hubby needs a tray like this, since he will not utilize the "key hooks" for keys!! 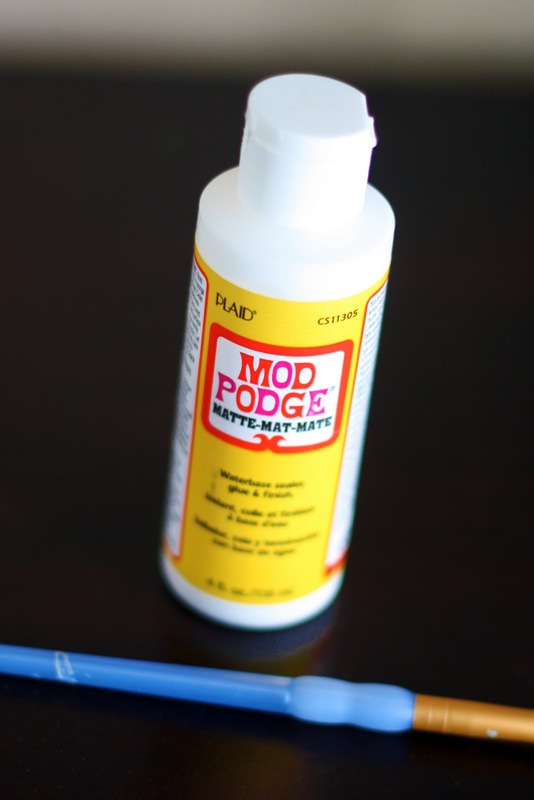 I love what a little paint, paper, and Mod Podge can do! Thanks so much for sharing! Love this. But question- how do you keep the cord from slipping out of the hole when it's not plugged into the phone? That's always my biggest problem with these bc. you are just "re-threading" to plug the phone in, which is more trouble than it's worth. Great question Tami! You can always notch out a piece of the hole to tuck the cord in, or add a small clip or band around the cord once through the hole, so that it can go back out. We drilled this hole so close to the size of the charger plug piece that it had to be pushed tightly through and would have to actually be pulled out, it won't be going anywhere on it's own. Great Idea Jen! I Love it... think I should make me one too. I love that! 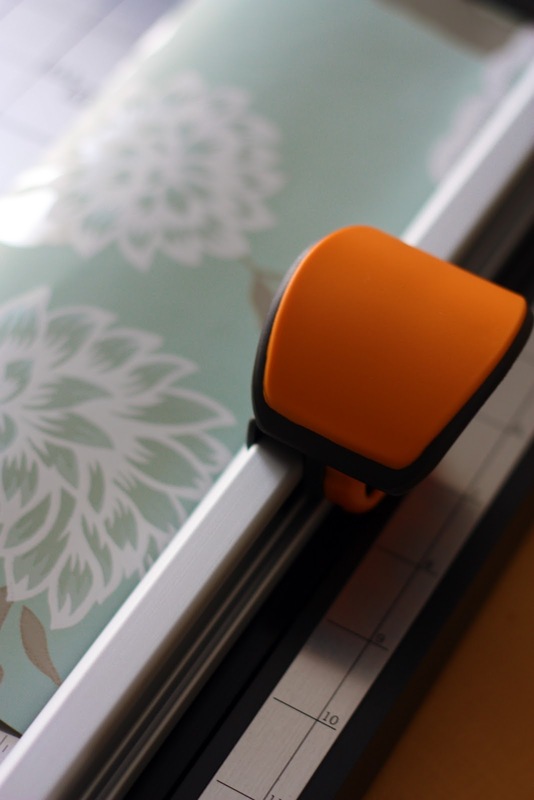 Great job and thank you for sharing!I am so picking up one for myself on my next IKEA adventure! Oh, I need one of those! What a fabulous idea! A use for my Melissa and Doug trays! I couldn't stand to throw them away... I knew they'd have a use! Great Idea! I need to do this for myself. I'm always looking for the last place I charged my phone to find the cord. Clever idea! My hubby's stuff rarely makes it past the back entry. When it does, then it's on the kitchen counter. I need a tray type thing to hand on the wall in our miniscule entry for him to dump his stuff in/on. We currently have a shelf there for that purpose, but things roll off. I have an idea for his tray, and if that doesn't work, I may just get that Ikea try and screw it onto the wall with some brackets. Yours is very cute with the white paint and wallpaper. GREAT project! I love this! I want to get more trays for odds and ends around the house...like the dish soap in the kitchen! Love that idea! I completely heart this project. My hubby needs one of those and quick. 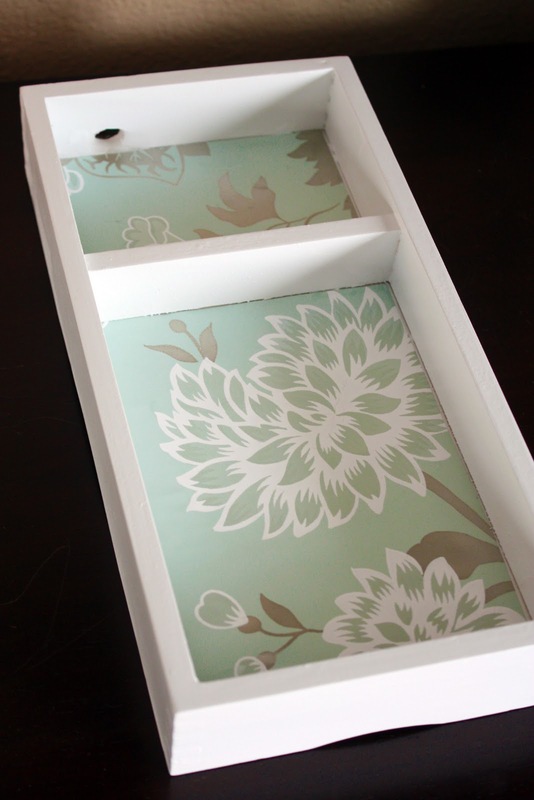 Thanks for sharing such a great DIY project. Now I have to find the time to do the same thing for my hubbies nightstand. I LOVE this. My hubs is in dire need of a home for his things. I am definitely adding this to my list for my upcoming IKEA trip! Awesome idea! Where do you get your super cute wallpaper?! @Gina...good call on the M+D tray re-purpose...off to find some! I've got to try this!!!!! My husband always forgets to empty his pockets. I was just thinking a little place for all that stuff would be perfect. You read my mind. I can't wait to make one myself. i'm in full agreement on the Melissa & Doug toy "trays". We got our daughter 6 or so sets of Melissa & Doug toys Christmas. I was looking to do something with them, other than the obvious drawer divider. 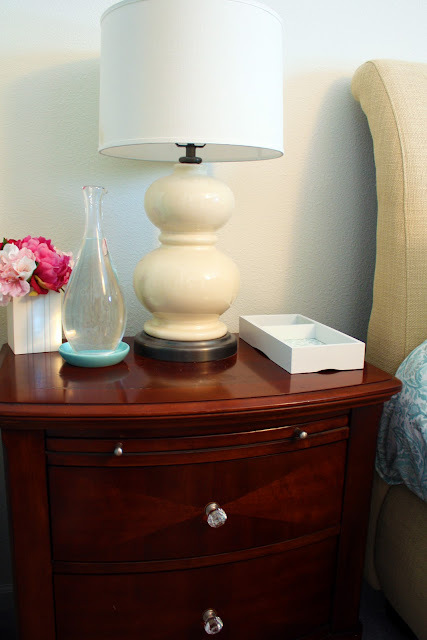 I can definitely use something to go on my nightstand! Where do you find cute wallpaper? Whenever I find a place that sells it, it is not modern and pretty like yours! Awesome! I think I need something like that! I just found your blog last week and I LOVE it!! 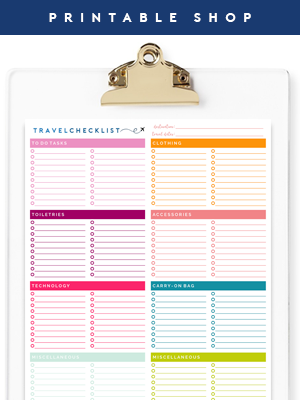 So many of your posts have been helpful, especially the ones on storing/organizing paper. After looking at your playroom, I'm dreaming about what we can do with ours to make it more organized. Also, I was wondering where you got the charging station that you use? It would look great on my desk! Thanks! What a great idea! I wish I was more creative! my husbands nightstand is itty bitty. and his phone cord was ALWAYS on the floor. So I took an old coffee cup that was re purposed as a flower pot and re-re-purposed it as a phone holder. Now no more blinky light when he gets a message. Awesome! I'm totally whipping one of these up! What kind of spraypaint do you like? Is it the same brand you used for your now silver lamp? 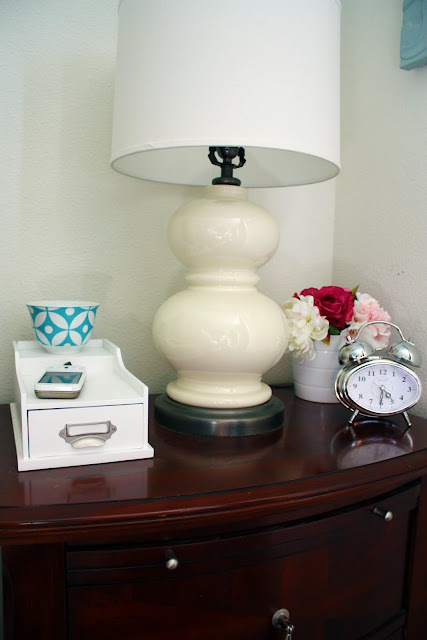 I actually used Rustoleum 2x Spray in White Blossom. My favorite white spray paint! what a great idea! how super cute, yet functional all at the same time! Okay... it's official. You are now my new BFFBG...my new best friend forever blog girl. No before you ask yourself this, I am not a stalker, or crazy, or anything of that sort. I am just a huge fan. You read my mind on a daily basis of projects I am working on.I just started reading you at the beginning of the month and I now check everyday first thing. I enjoy you with my morning coffee and am always super glad I logged on. I adore coffee like you I must admit and am curious what you use as a de-scaler, doesn't vinegar and water do the same thing, or am I ruining my machine? I wanted to make a cute cell phone charger and was thinking about it yesterday and BINGO this post is here. I was looking forward to organizing paperwork this month and this month you discuss that. I couldn't decide what to do with my office and you answered my paint questions and gave me an inspirational color scheme and adorable and whimsical office scheme that I would have probably not considered-light blue and white. I have begun the office and I love the results I am getting. I appreciate that you aim all of your projects and organizational ideas on low-budget or no-budget ideas with a few splurges here and there. That is so me! I adore saving money and discussing my finds....it is my favorite pastime. 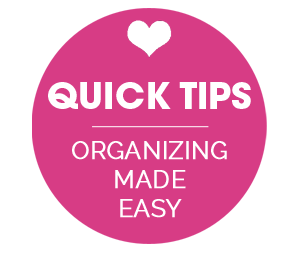 A lot of organizing/ home beautification blogs out there are aimed at spending a lot of money. I appreciate that yours is not and it is written for the everyday not-rich person. Thank you for blogging. I am inspired by you and am even considering starting an organzational/ craft blog. 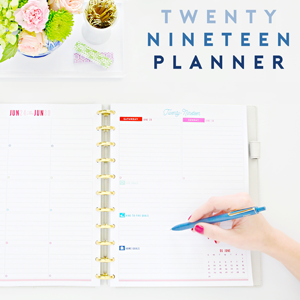 I love organization and laugh every time I hear you call yourself crazy or obsessed because I am SO there. My nickname in college was "Monica" from the show Friends, i am sure you get the reference if you watched the show. Thank you again for all of your hard work on this blog. You are truly talented and creative and clearly very hard working. GENIUS! I have a little Ikea container like that but with a handle. It's sitting in a closet - not for long :) Great idea! As always, your ideas are the bestest!! Not only cell phones but think of all of our kids electronics that need charging OMG. The Nintendo DS, the Leapster, the Pixter, the Ipod's etc... This would be great!! Another awesome project. I have been looking for a charging station myself but they are all pretty expensive. It is so worth making. Happy Friday. So cute and clever, LOVE IT! Thanks for posting. Also, I was reading an old post of yours and you mentioned how you always use 20% coupon codes for the container store... how do you get them??? IKEA is 7 mins from my house. Guess where I'm going today??? AHH! So stinking cute!! I was just thinking the other day how could I make one of these beauties, cause the store kind are a little out of my budget. Thanks for the inspiration! I love this! I can't wait to make one for at my nightstand! So, I made a trip to Ikea (the website said that product was most likely in stock) only to buy everything BUT this because there were none left in stock :( :( :(. But I did get that pretty brown glass container without even realize you took pictures of that in the original shopping post. It's amazing! Hopefully I'll have pictures of a successful replacement for that charging station box. I'm currently redoing our back entry (built in lockers! ), and I intend to use your tray makeover idea in there. My husband and I both need places to put our keys, etc. We had a couple of mismatched wall shelves before. So I'm going to hang up one of these trays for each of us, using little brackets. Hi! 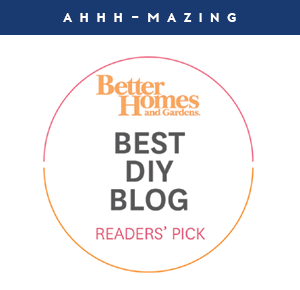 I love your site and your home is amazingly cute! Where did you get the little flowers that are on your nightstand? Are they real or silk? 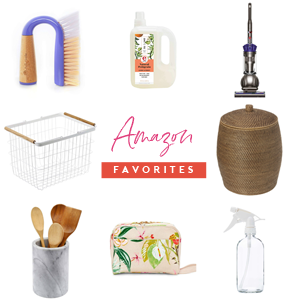 I love your website - just discovered it and am obsessed! But doesn't the cord keep falling out of the hole? If not for that, I'd try this. I love what you do with wallpaper, btw!! Do you buy a whole $50 roll or do you find smaller pieces? We made the hole just barely big enough to fit the cord so it actually was hard to get through and stayed just fine. The wallpaper was leftover from a large scale project where we wallpapered an entire closet. I typically purchase one or two rolls for a major project and save it and reuse it until there is nothing wasted. 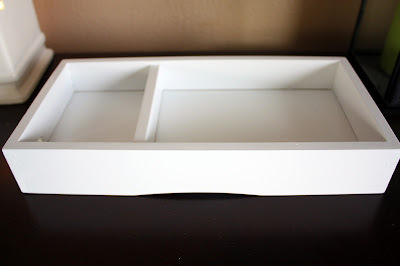 For everyone that loves the tray, but either can't afford or don't live close to an Ikea- WalMart & Lowe's both have very similar trays in their kitchen /closet organization sections. I'd guess that Target & Kmart & Home Depot do too, but I rarely shop there and I REFUSE to step foot in a HD so I can't say for sure. WHAT A great idea!!!!!!!! Will have to do!!!! I know this post is older, but I just wanted to say thanks for inspiration! I found an old tray that used to be part of a kid's game at Goodwill a few weeks ago, and I think it just might, maybe, work perfectly for something like this. Finger's crossed!